I Love You To Hell And Back. 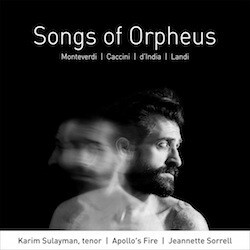 Lebanese-American tenor Karim Sulayman’s neat encapsulation of the Orpheus myth infuses his solo recording debut, Songs of Orpheus. Orpheus, the greatest singer of all time, famously followed his deceased beloved Eurydice to the gates of Hades in an attempt to bring her back to life. He was thwarted by the gods who forbade him to gaze at her during their journey back to earth. 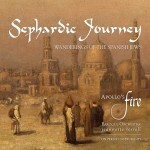 He could not resist, and the tale has been told in numerous musical interpretations including those of Monteverdi and his 17th-century compatriots who are represented on this imaginative album, performed with leading baroque interpreters Jeannette Sorrell and Apollo’s Fire.